EDINBURGH CAPITALS forward Sean Beattie is set to play his 100th game for the club when they tackle Nottingham Panthers away tonight. Caps begin a run of three games in four nights, all away from Murrayfield where they have been so strong of late – winning their last five. The purple patch on home ice – alongside a recent win in Sheffield and a valuable point picked up at Manchester Storm – has been good enough to propel Capitals to fourth place, albeit level with three other teams in what is sure to be a tight Elite League table. Beattie who, as part of the Edinburgh Capitals Academy programme also plays with the club’s Scottish National League side, continued: “Our win on Saturday against (league leaders) Cardiff was especially pleasing. I think they’d only lost twice all season so to be the underdog and beat them the way we did was great. Asked to pick out a highlight from his first 99 games, Beatie insisted Saturday’s 6-2 win over Devils wasn’t on his list. 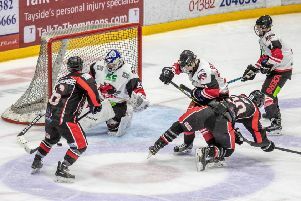 The match saw Beattie involved in his first Elite League fight as he clashed with Cardiff import Zach Hervato. Caps play Coventry Blaze tomorrow before rounding off their week on Saturday with a trip to Manchester Storm.